Wacom touts its Intuos5 to be the premier graphics tablet for the professional and the enthusiast alike. But is the Intuos5 really worth the price tag? Just about any computer illustrator will tell you that a mouse is no good for drawing. The motion of a mouse or touchpad is neither as natural nor as precise as a pen stroke. It is for this very reason that the market for graphics tablets exists. 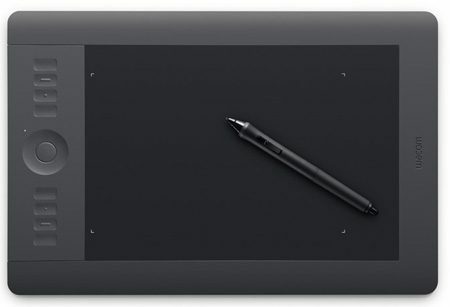 Here I will be reviewing the Wacom Intuos5 Touch Medium (PTH-650). While full of features for the hobbyist, Photoshop Elements is not the full version of Photoshop nor is Corel Painter Sketch Pad the full version of Corel Painter. Installing was quick and easy. After inserting the driver DVD all I had to do was plug in the tablet and click ‘next’ a couple of times. Total setup time was less than 10 minutes. Available in four different sizes, the Medium model which I am reviewing has about the same total surface area as a standard 15.4” laptop. The tablet’s actual drawing surface area, visible between the white marks in the image, is just a little larger than an A5 sheet of paper. The tablet has eight function buttons and a function wheel which can be set to perform one of four programmable tasks. I found the function buttons to be a great addition; however I did find the preset functions included with the software a little limiting. While it is technically possible to set a button to emulate any key stroke (e.g. Ctrl+Z for undo), the Intuos5 software is not program aware. This would not be a problem for most users, but I still found it to be a small annoyance. For example, I can set a button to ‘undo’ in Corel Painter (Ctrl+Z). But to step back (i.e. ‘undo’ more than once) in Adobe Photoshop, I need to change that button to Ctrl+Alt+Z. While this is really an Adobe issue, I would have expected the graphics tablet to have a cross-program ‘undo’ preset. Despite this, the function keys are excellent. Mistakes can be undone without reaching for the keyboard and the zoom level and brush size can be changed with a flick of the function wheel. As advertised, the PTH-650 is also multi-touch and gesture capable. The Intuos5 is essentially a large sophisticated laptop touchpad, thus it can be used as a replacement mouse. The multi-touch and gesture features work well, and the settings program provides a fair amount of flexibility for assigning functions to each gesture. The touchpad itself is cleverly designed. 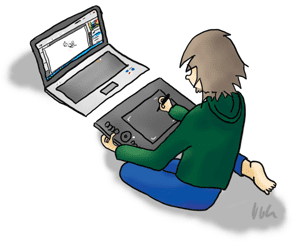 Users can lean on the tablet while they draw without unintentionally activating the touchpad. My real fear was that the tablet would require superhuman hand-eye coordination to use. But Wacom left me pleasantly surprised once again. The pen (which requires no cable or batteries) moves the mouse when it is hovered over the tablet. I found that this allowed me to easily guide and position my strokes while drawing. I also appreciated the pen’s pressure and angle sensitive capabilities. In Photoshop, a stroke’s opacity, angle, shape, weight and thickness can be linked to the Intuos5’s pen pressure and angle. This enables users to quickly create detailed shading and line work. What surprised me the most was the pen’s feel. The pen glides over the surface of the tablet like a pencil over paper. Drawing with the Intuo5 feels natural. And the pen even comes with a working (virtual) eraser on the end. While I may not be much of an artist, I have produced images which I wouldn’t have though possible over the last two days. So far, I have found illustrating with the Intuos5 and Photoshop to be far easier than a pencil and paper could be. The easily accessible function buttons and natural feel of the pen’s strokes make the Intuo5 a product I am glad to own. However, the Intuo5 is just one of many products designed for the same purpose. There are less expensive graphics tablets for casual users, and higher end tablets with LCD displays for professional artists. Wacom’s website offers the Intuos5 for $349, but the same model may be found for considerably less through other retailers. Some retailers may stock the slightly less expensive Intuos5 PTK-650 which does not include touch functionality. Have you used the Intuos5? Have questions? Leave your comments below!